It’s widely accepted that data is the key to nurturing business growth and measuring ROI. It’s also pivotal in maintaining a continuous improvement process, be that web design modifications, campaign optimisation, content planning or user journey analysis. So you would expect that marketers would be forensically dissecting their data on a daily basis, looking for clues to improving performance – from minimising bounce rate, to maximising the proportion of customers that flow through each stage of the funnel. But it’s clear from Emarketeers’ State Of Analytics 2017 Survey of marketers in the UK, that this simply isn’t happening. 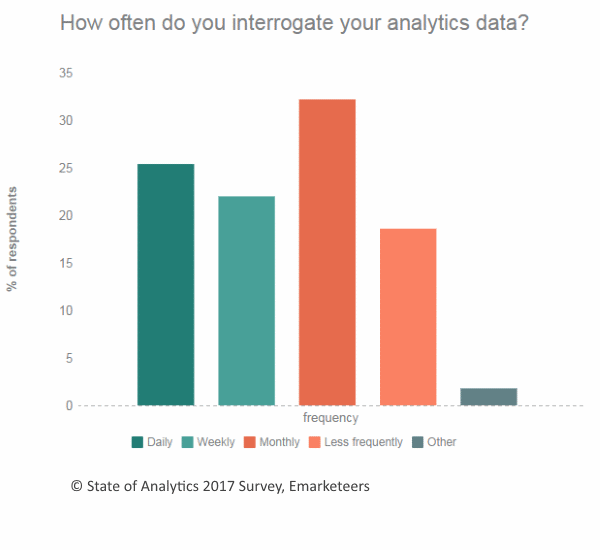 For example, 32% of our sample only interrogate their analytics data monthly, and 19% do it even less frequently than that. Only 25% of the sample look at their analytics on a daily basis. Perhaps more surprisingly, analytics findings are being used as part of a continuous improvement programme at a shockingly low rate – 56% of marketers surveyed implement learnings from their data ‘sometimes’, ‘rarely’ or ‘never’. Only 15% always made the improvements their analytics suggested. 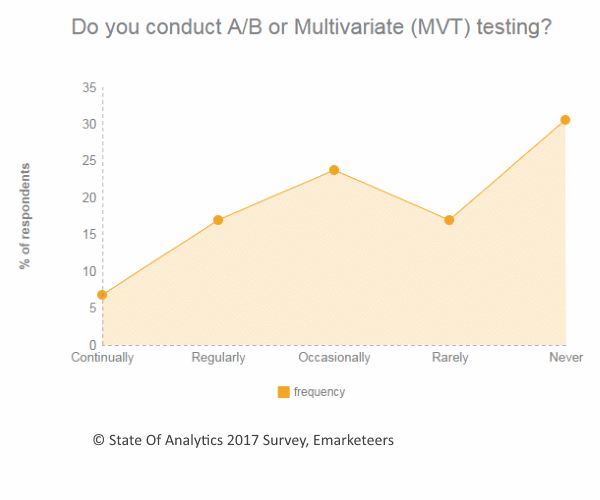 This lack of implementation was reflected in the low take-up of website optimisation techniques such as A/B or multivariate testing. Only 7% had a structured programme in place to evaluate changes to the website, and almost half admit to running A/B tests ‘rarely’ or ‘never’. 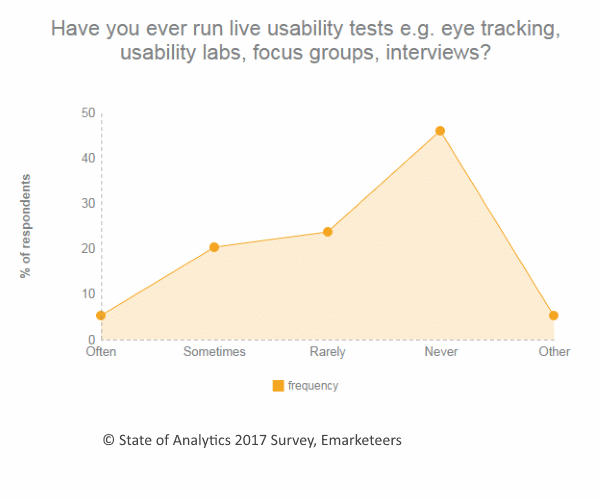 Adoption of other techniques beyond the use of Google Analytics is also low – almost 70% of the sample ‘never or ‘rarely’ employ live usability tests like eye-tracking and usability groups. So what’s the problem? Marketers clearly appreciate the importance of their website for their business performance, and of using their analytics to guide them in optimising the user journey and measuring the effectiveness of their campaigns. The problem is one of aptitude, not attitude. 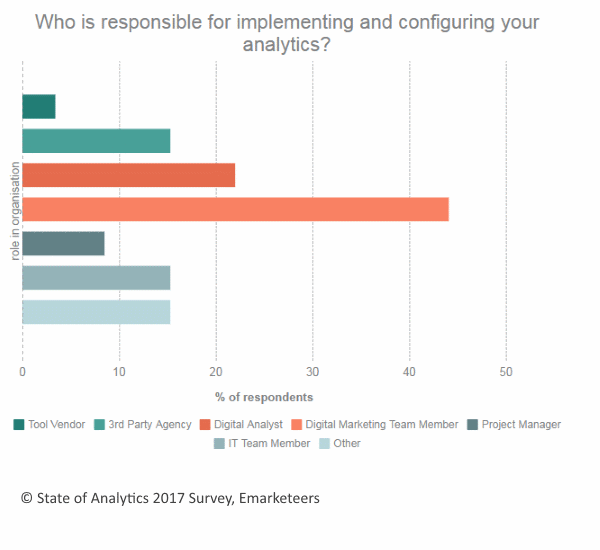 The single most important point is that almost half (44%) of our sample admit they simply don’t have anyone in their team with the experience to use Google Analytics beyond top-level dashboards. And even those with deeper knowledge in their teams struggle to set up analytics in such a way as to understand their most important user journeys (cited by 41% of the sample), or align their data and reports with business drivers (37%). 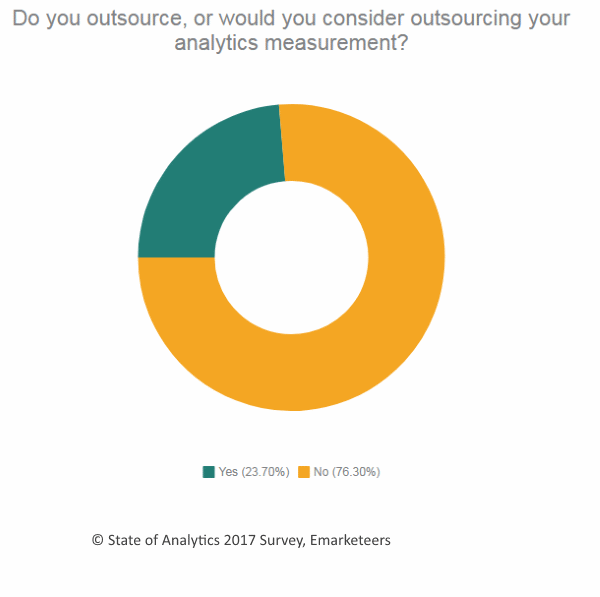 Most are unwilling or unable to outsource – only 15% use a third party agency and just 24% would consider outsourcing analytics measurement in the future – so the only obvious solution is to invest in resource and/or up-skilling to bridge this gap. Every potential customer will encounter a brand’s site at some point in their purchase journey and if that site has technical, content or design issues, all other forms of marketing spend will be performing well below their optimums. It may take a modest investment in time and money for marketers to overcome the analytics performance gap, but it’s an investment that will be rich in dividends. For further details of Emarketeers’ State Of Analytics 2017 Survey, please contact Jonathan Saipe or Tracey Stern.